The Naushon Daily Agitator, Martha's Vineyard, Mass. 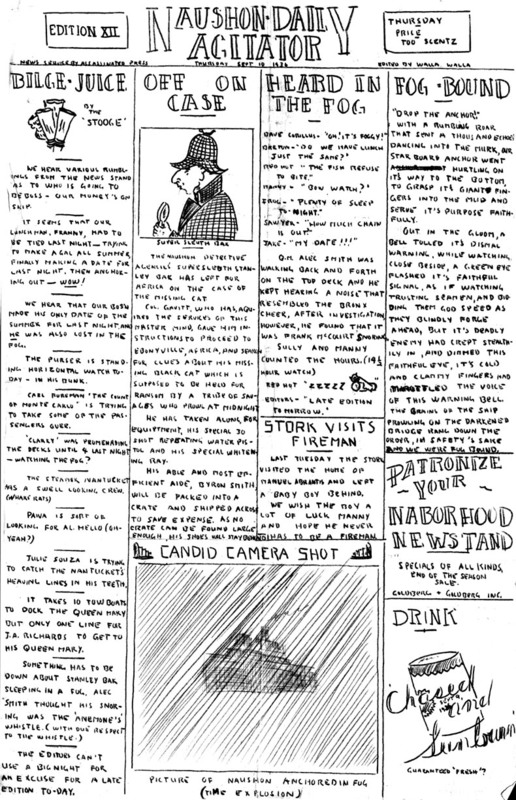 I found these mysterious, hand-drawn, satirical "newspapers", all evidently drawn in September 1936 by and for the crewmen of the steamer Naushon. Who was the editor? Can you identify any of the people mentioned? Does anyone have any other issues? I will try to add more issues over the next few weeks. If you have trouble loading the pages in your browser window (they're big and slow) try right-clicking or clicking-and-holding and choosing "Save Target" or the equivalent. Edition X - Tuesday, Sept. 8, 1936 --------------------the images are coming soon! Edition XV - "Tuesday and Wednesday's Edition"